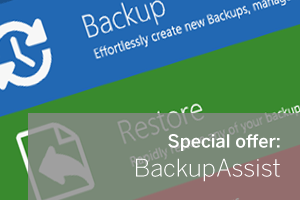 As if BackupAssist wasn’t already priced competitively enough, you’ll be pleased to know we’ve just introduced two new discounted bundles to make it even better value when you’re buying with plug-ins! I’ve outlined what’s included in each below and you’ll find up to date costs on the pricing page of the main site. The superb new Exchange Granular Restore Console Add-on (EGR) makes it possible to restore both individual messages and mailboxes directly from an image backup of your server, without the need to run a separate backup job. Purchase it at the same time as BackupAssist and we’ll provide you with a 25% discount off the RRP – just look for the bundle on our pricing page. More info on the EGR is available here. We’ve also neatly wrapped up all the components you’re likely to need for your SBS Standard or Premium installations. Microsoft do plan to end of life SBS 2011 at the end of 2013 but we’re still seeing plenty of demand so are happy to be able to offer great value and some convenience when ordering to those customers still using it. This bundle consist of BackupAssist plus the EGR add-on and the SQL one too, with a discount again on the EGR only. The full version of BackupAssist is available to trial, along with all of the plug-ins mentioned above and more, from our Web site here.